Tires help our cars go. And when it’s time for new tires we throw out our old ones. But what if you didn’t have to? 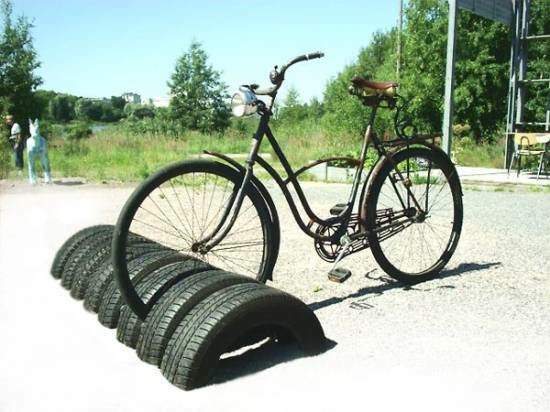 What if you could reuse your old tires? What if you could transform them into something completely new? Or even useful? Well, you can. 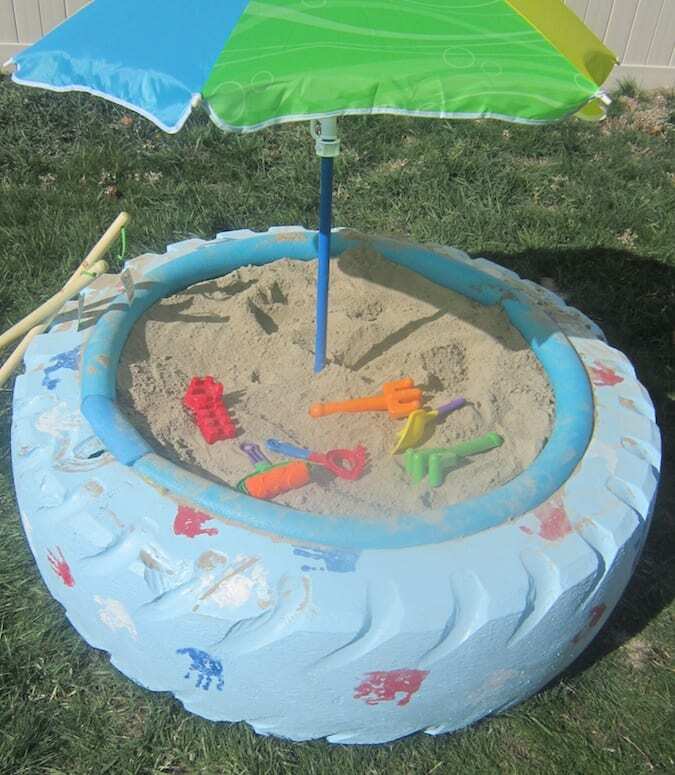 There are lots of ways to upcycle old tires. 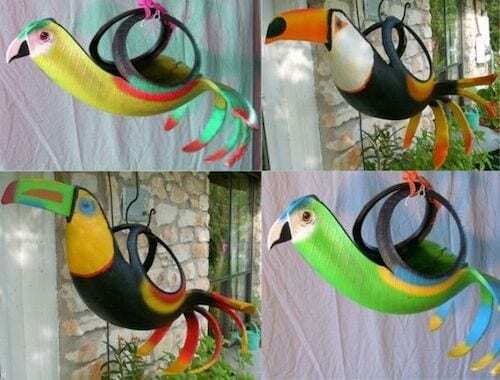 Here are 40 ways to upcycle old tires. Sandboxes provide endless hours of fun. 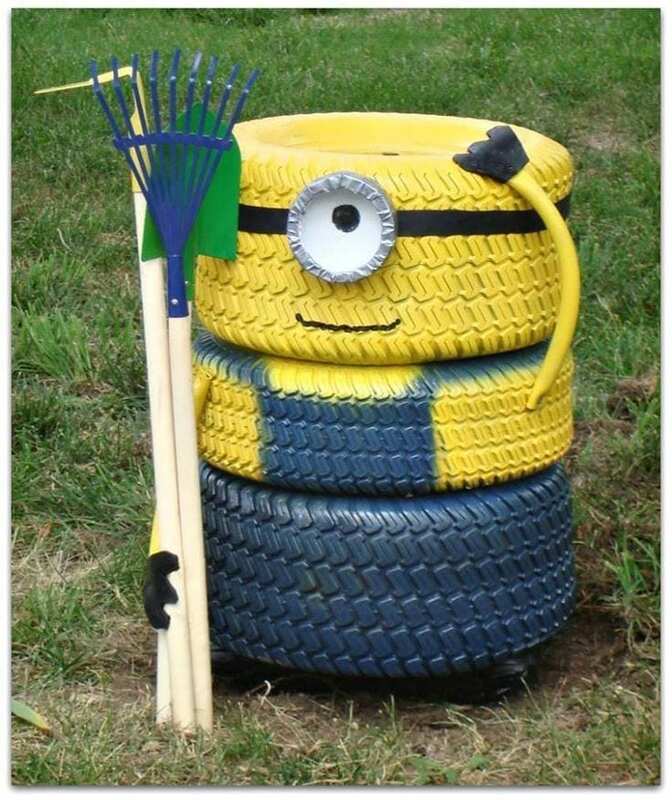 You can make a really cool one from old tires. Get the full tutorial here. 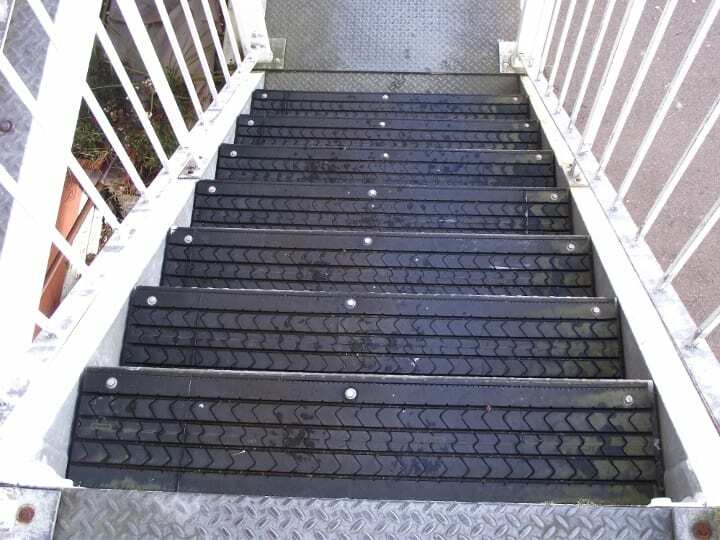 Need skid-proof steps? Cut your tire and flat it out into strips. Nail it to your steps. Ottomans can make a beautiful edition to your home. But why pay for one when you can make one. 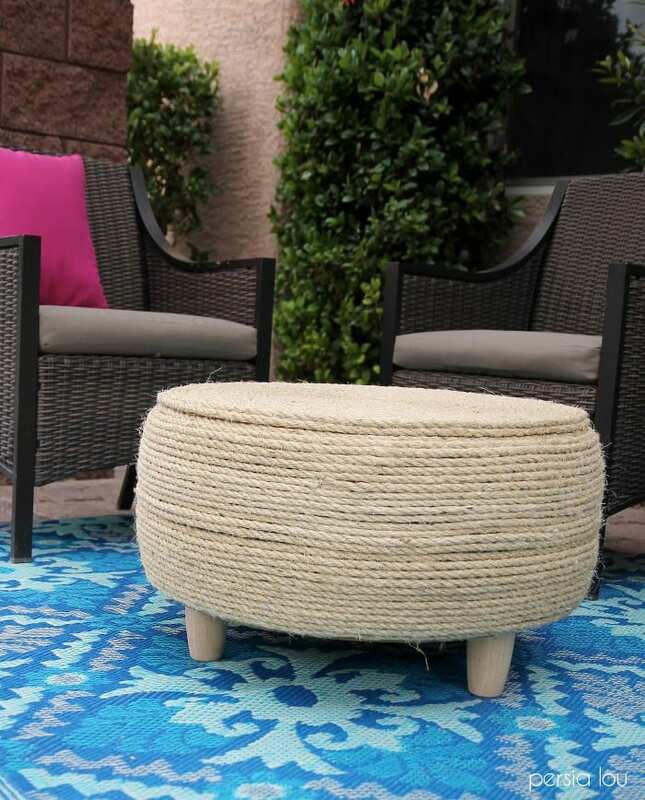 Get the tutorial on how to make a rope ottoman from a tire here. This is a similar project. It just turns your ottoman into a coffee table by adding legs. Get the details here. Teeter Totters are tons of fun. But it can cost you when you buy them. Learn how to make one here. 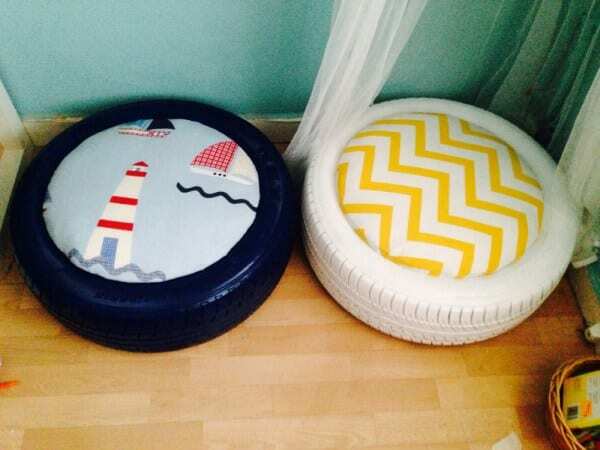 Need some cute seats for the playroom? Make them from tires. You’ll find a tutorial on how to make theses here. 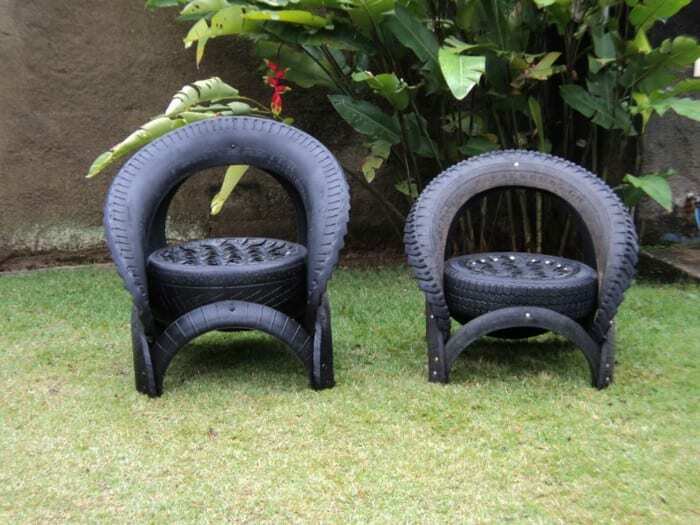 You might now believe it, but these chairs are made out of tires. They are really incredible looking. They look store bought! 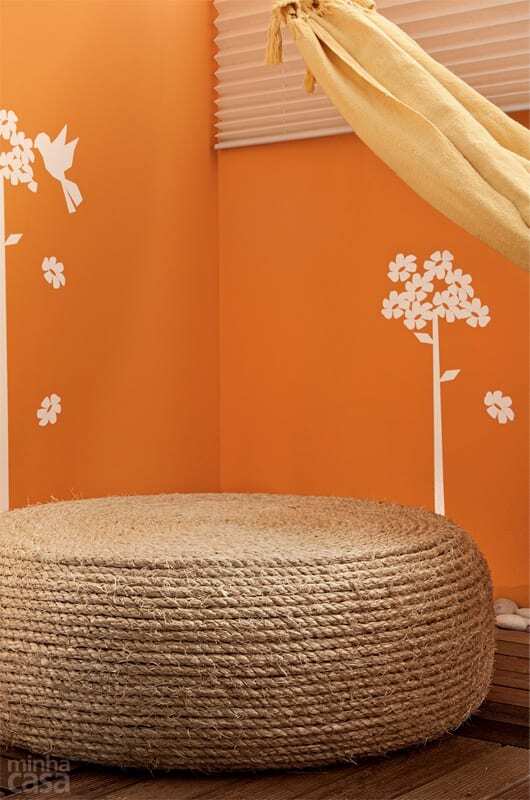 Does Fido need a new bed? 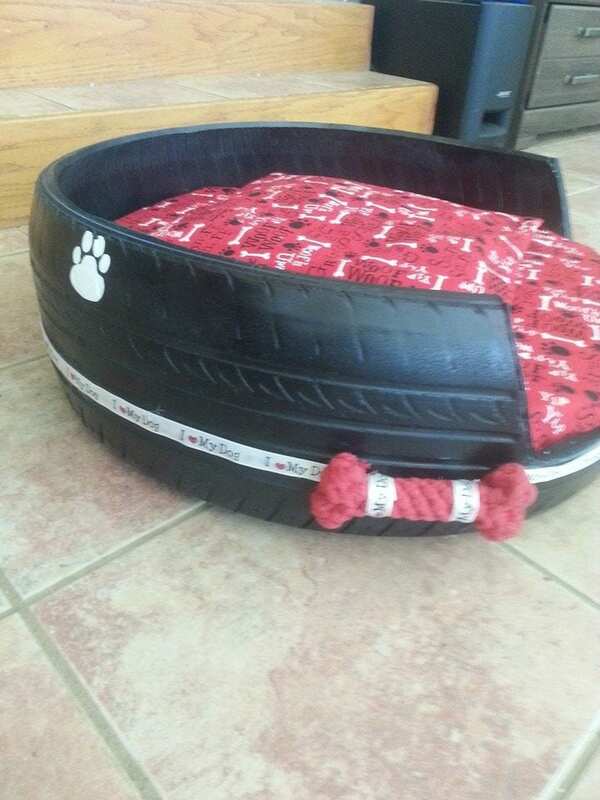 Make his a custome one with a tire. Get the details here. Tires can be used as beautiful decorative planters. Just bolt one to a tree and fill the bottom with your plants. You’ll find instructions here. Lookfing for something less obvious? 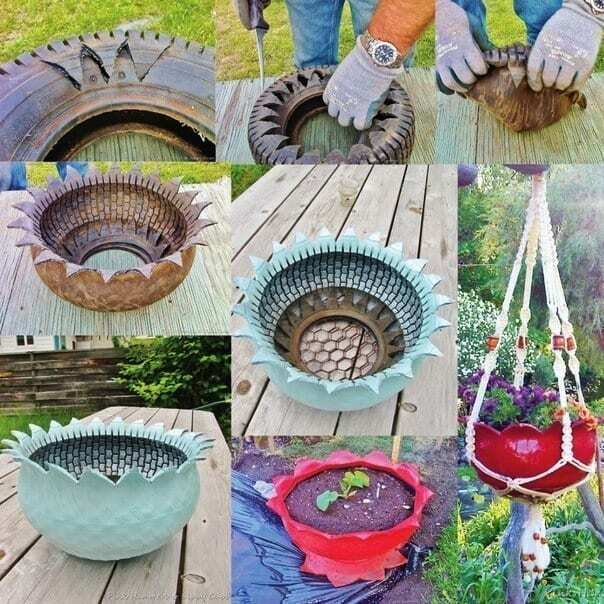 You can cut up a tire and turn it into a planter that looks entire new. These look gorgeous! 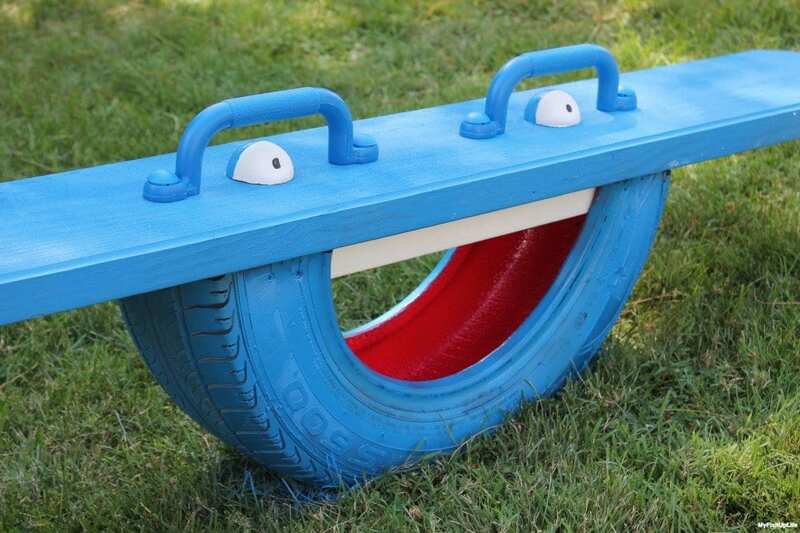 Want to add extra whimsy to your playground slide? Use tires to make a slide. Get details here. This is an oldie but goodie. 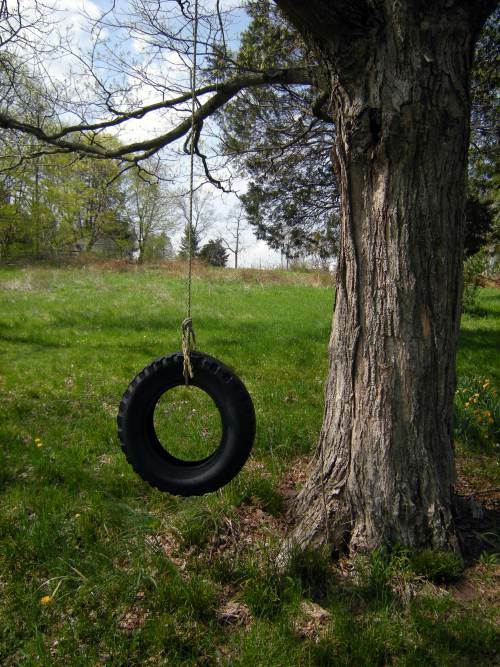 Tire swings make some great childhood memories. Learn how to make one here. Kids can learn how to keep things tidy with a toy shelf. Their toys will be on display but neatly organized. Find the tutorial on how to make one here. Does your home need a water feature? 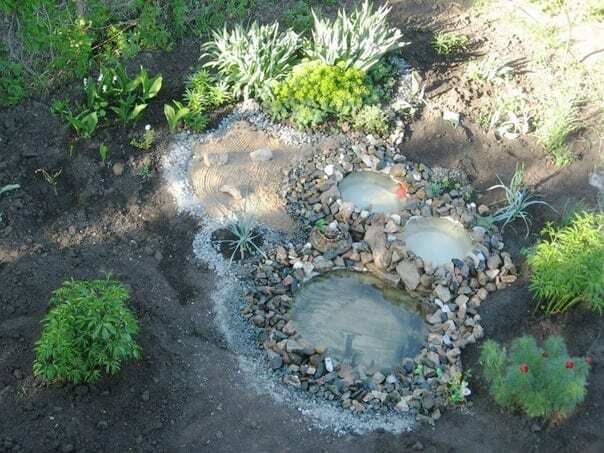 Use tires to create mini-ponds. Learn how to make one here. Don’t spend money on a bike rack. Make one from tires. Just assemble and secure some halved tires. 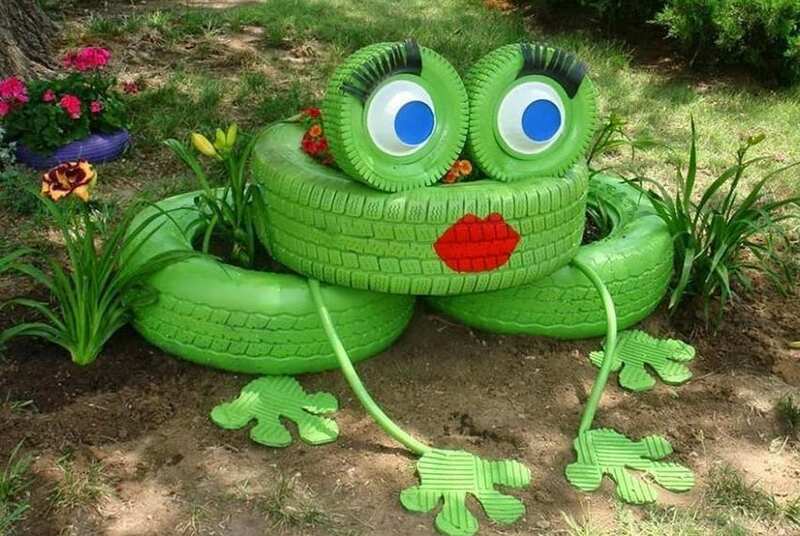 Use tires to make show stopping garden decor. Just paint and assemble. You can even add plants. Hoses look messy if you leave them out. Keep them nice and neat with a hose caddy. Learn how to make one here. 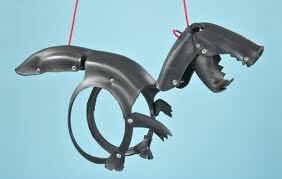 This horse swing is adorable and quite unique. And you can make one from a tire. You can also turn it into a dinosaur Get the instructions here. Need some extra seating? 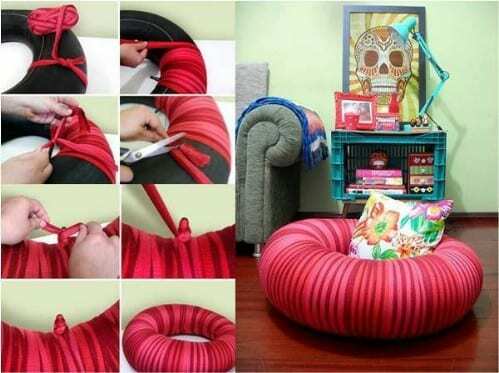 Make this casual tube seat. Just wrap a tire. Do you have kids who are fans of the Minon movie? They’ll love this garden Minon. Just paint and stack your tires. 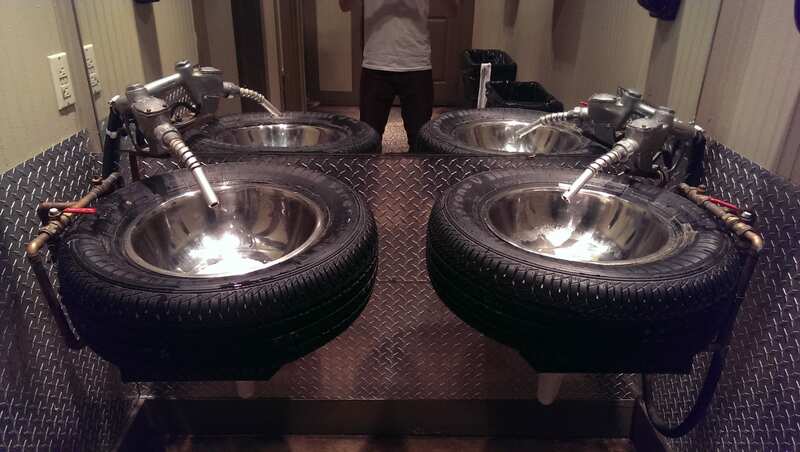 Tires man make some pretty manly sinks. Just add a basin on the inside. This is perfect for a man cave. Need a trash can? 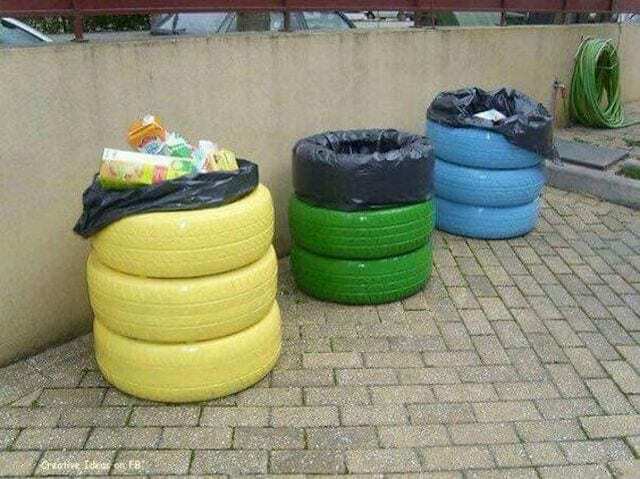 Grab some tires and paint them and stack them. Place a garbage on the inside. Are your pants sagging? 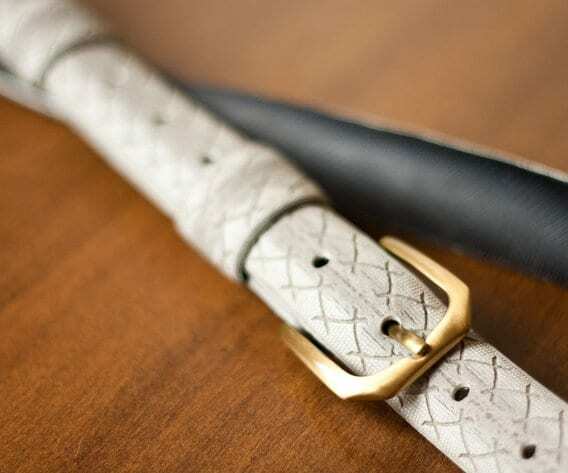 You can make a really trendy belt with some old bicycle tires. Learn how here. Our dogs can get pretty thirsty in the summer, especially if they are running around outside. 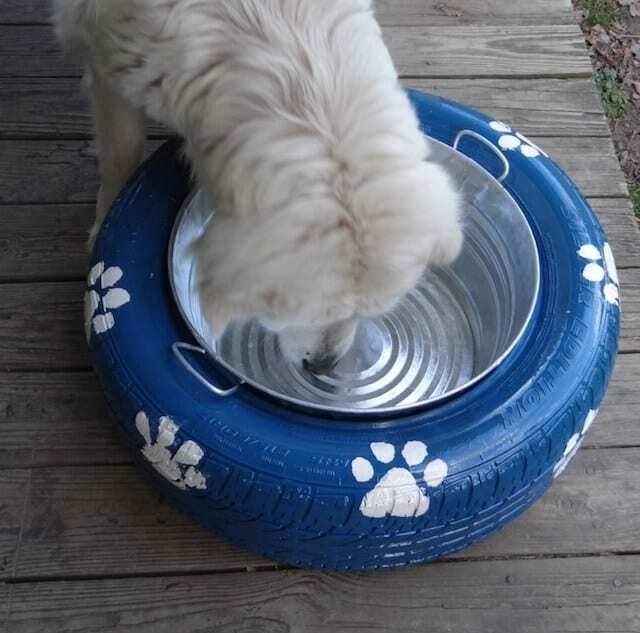 This giant tire bowl is great for multiple dogs. 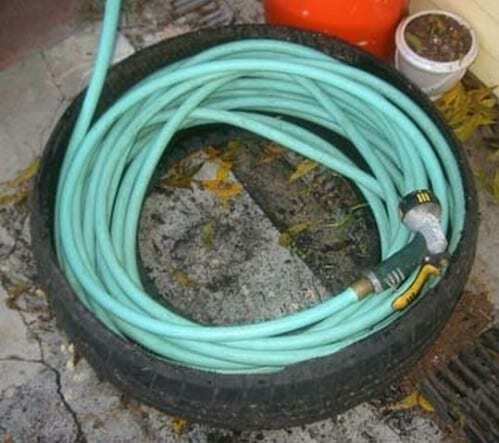 Paint a non off-gassing tire and place a bucket in the middle. Details are here. Needs some bass. 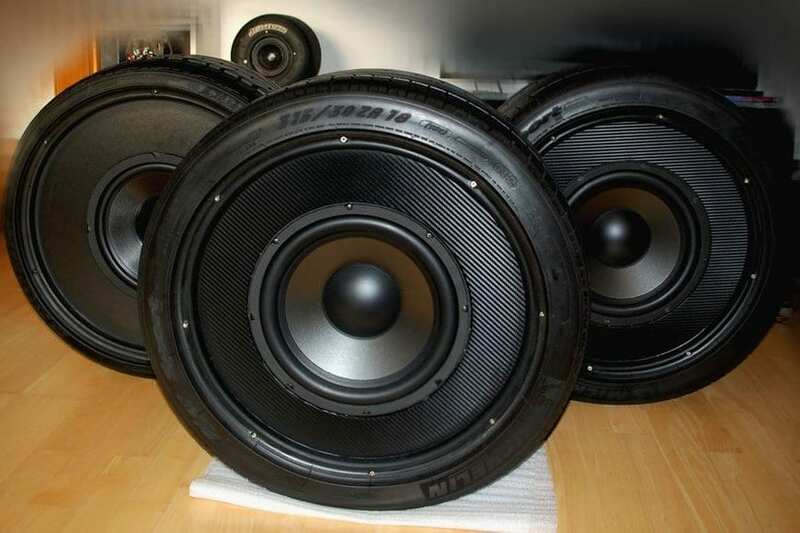 There’s a subwoofer for that. 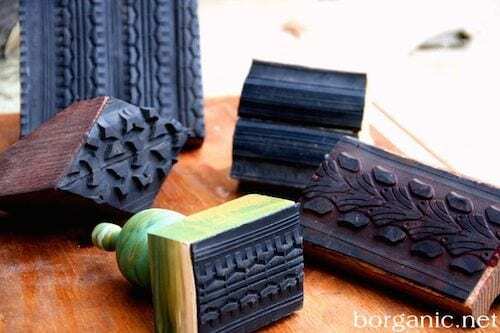 Learn how to make them from tires here. 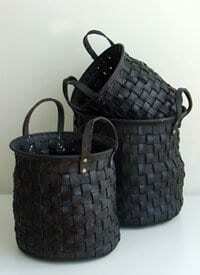 Tires can also be turned into beautiful baskets. Just cut the rubber into strps. Then weave. 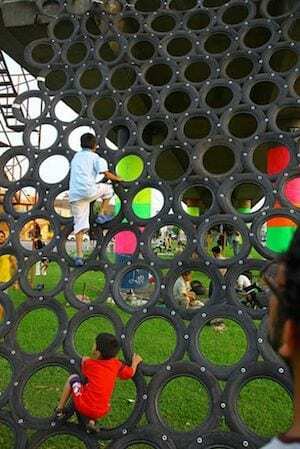 You can make a pretty epic jungle gym from tires. Just make sure they are securely fastened. 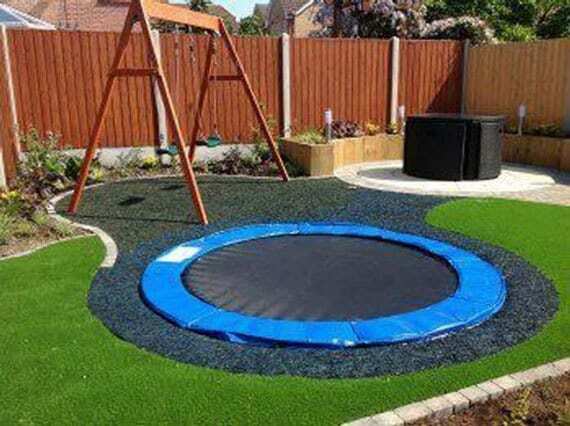 Kids will love to climb on their tire jungle gym. These lovely hanging birds double as planters. They were made from tires. The shapes were cut out, then they were painted. 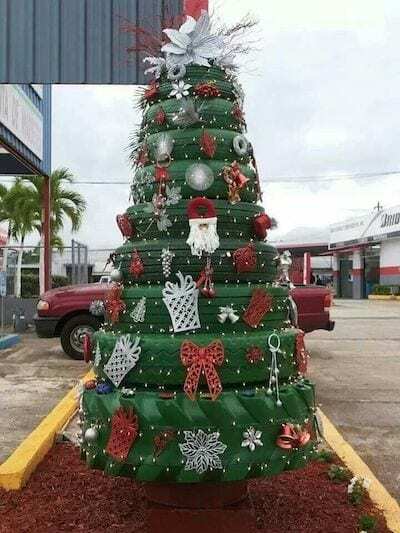 Want to make a durable outdoor Christmas tree? Just stack tires of various sizes. Paint and decorate with ornaments. Need a unique stamp? 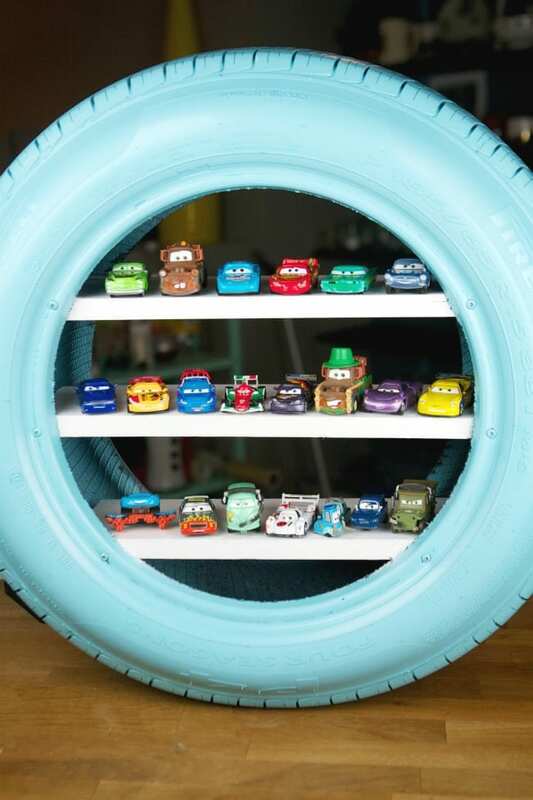 Create one from tire treads. Just cut up a tire and in rub in some ink. 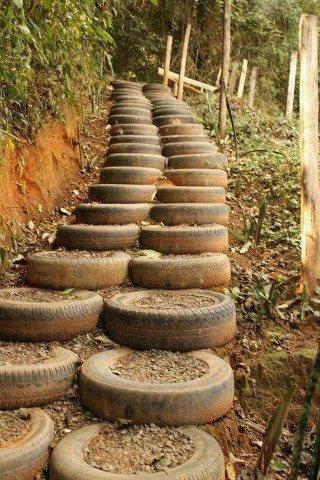 You can create a garden path with steps with tires. Just stack and arrange properly. Fill the holes so they are safe to step in. This is another great piece for a man cave. 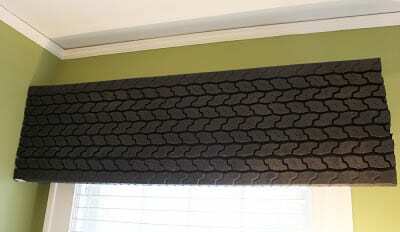 Make a valance from a piece of tire. Just cut up a tire and hang. 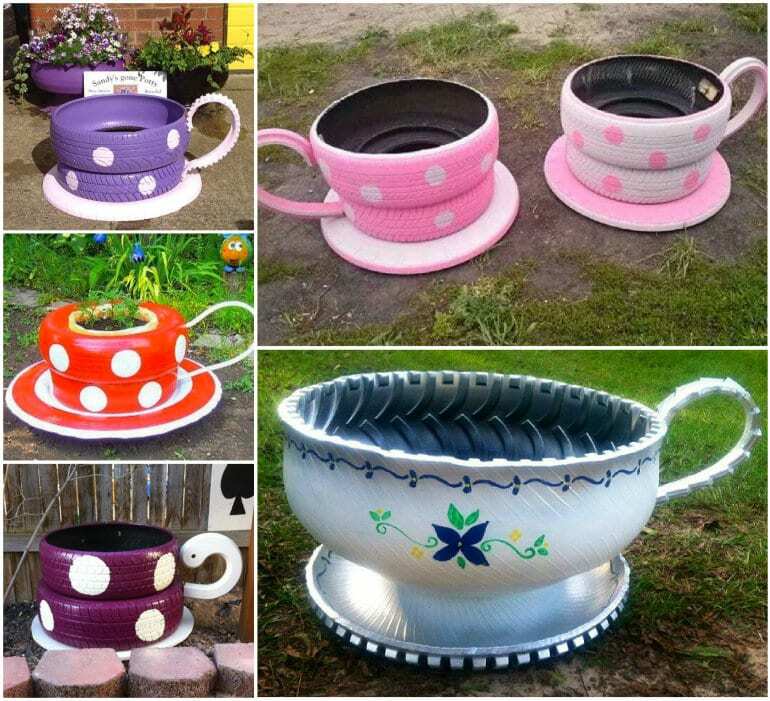 These tire teacups are just too cute. You can turn them into planters or seating. You’ll find details on how to cut a tire here. 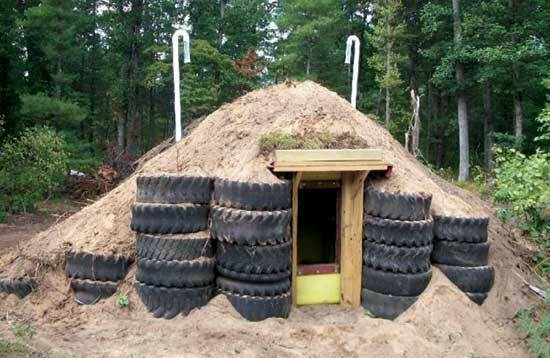 Storm shelters don’t have to be expensive. You can make one from old tires. Learn how here. It’s important to keep children safe when they are on the playground. Tires can help with that. 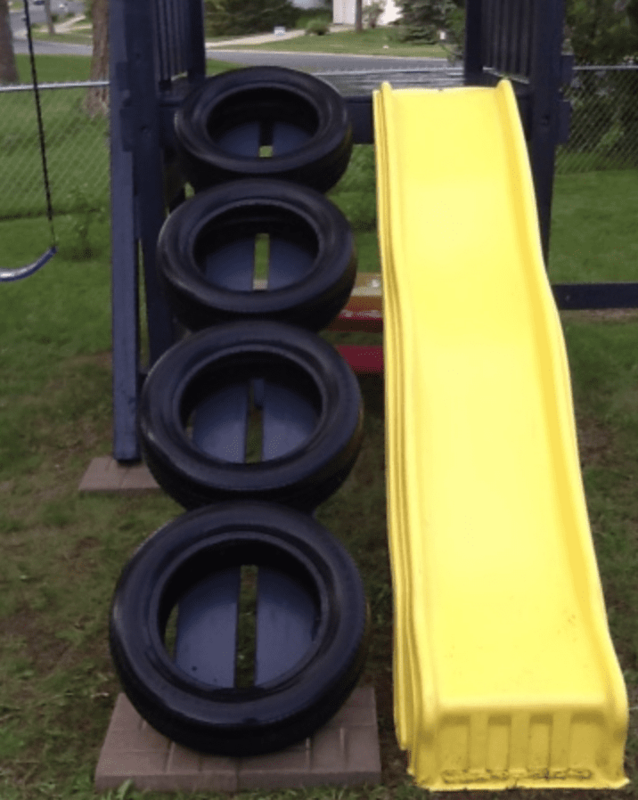 Shred up non-toxic tires and place them around the playground so that kids will have a soft surface if they fall on the playground. This is quite the unique piece. 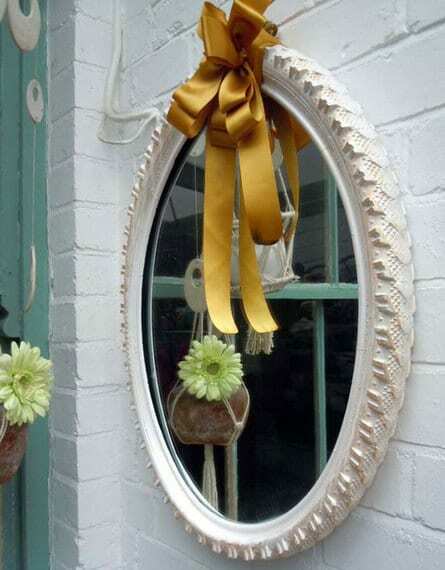 It turns a bike tire into a frame for a mirror. It’s painted for a shabby chic look. Need a durable welcome mat? Weave one from pieces of tire. Just cut the tire into strips and weave.